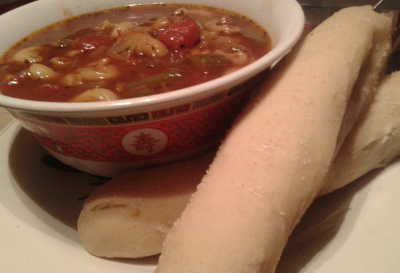 Too much to do, too cold to go out... A pot of soup and some fresh bread sounded just about perfect. Checking the fridge and pantry there was no doubt that minestrone would be the soup du jour, and why not some breadsticks a la Olive Garden? Yeah, I thought so. 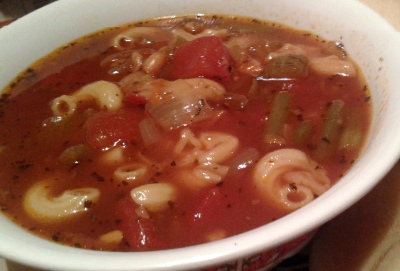 I used this recipe for minestrone as a guideline, but as I had a few projects underway, altered it for the crock pot. Basically, I added the ingredients in the same order, just let them “simmer” on high for an hour or so instead of the minutes of constant stirring if I had sauteed. I wish I had taken a picture of just the onions – they were starting to caramelize beautifully! Then in go the garlic, celery, a little while later carrots, green beans... Finally tomatoes, beans (from the freezer), beef stock and pasta... BIG TIP: I boiled the pasta in the broth but only added the stock to the pot. That way I could add the pasta to each bowl without it getting mushy! I started the breadsticks once the onions were ready - they're really quite easy. I didn't have bread flour, so I used AP – it needed about a half cup more than stated, but that's an expected difference (but use bread flour if you have it - even better final result). Blend/knead, rise. Shape, rise. Bake, brush, sprinkle. Yeah, a little TOO easy, if you know what I mean – just might make these too often!